Begonias have been a grown in Australia for years, almost regarded as old fashioned, however with new varieties being bred, the Australian gardener has access to a huge range of plant. A a very popular indoor plant as well as a garden plant and come in a number of varieties including : Cane Begonias, Rhizomatous Begonias, Wax and Tuberous types. All are different in growth habit and appearance. Begonia Rex are used widely as an indoor foliage plants. Being easy to grow, long flowering and with nice foliage begonias do well in pots. We mainly see the hybrid varieties available for sale and these include three main types. Begonia grandis is a hardy tuberous type. Plants and cuttings are readily available for sale from online specialist and mail order Nurseries. The ‘Rex ‘ types are popular for the texture and colour of the foliage, the rhizomatous types as similar to the Rex types, but tougher and easier to grow. The Cane Stemmed types are perhaps the easiest, many seeming to thrive on neglect. 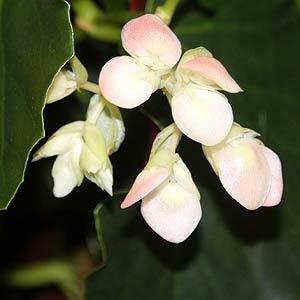 A number of species are also available and some of the more popular Begonia Species include : Begoniacae, acetosa, acida, acontifolia, acutifolia, alboptica, bogneri, brevirimosa, cinnabarina, conchifolia, cucullata, semperflorens. Although they are a tropical to sub tropical plant they do grow well indoors in cooler regions, grow them for the flowers or the foliage, colour and texture is what begonias are all about. All begonias like a light but moisture retentive potting mix and this can be achieved by adding 1 part perlite to 6 parts quality potting mix. You can propagate many types ofBegonias from leaf cuttings. From each leaf you can usually get 4 – 5 cuttings. Before you start, prepare a propagating mix of 50% perlite and 50% peat moss. The peat moss retains moisture while the perlite improves drainage. This should be placed into a propagating box ready for you to plant the cuttings. Cut the Begonia leaf so that each section has a vein running to the centre of the cutting. You will end up with triangular shaped cuttings. To improve the chances of getting them to strike (form roots) you can use a rooting hormone powder. Dip the exposed end with the vein into the hormone powder. Use a dibbler (stick) to make a hole for the leaf cutting tip, insert the cutting and repeat with the other cuttings. Space then at around 2.5 – 5 cms or 1 – 2 inches apart. Mist spray the cuttings and put the lid on the propagating box, this helps maintain humidity. Keep the propagating box in a warm position, mist spray every few days paying attention to not letting the propagating mix dry out, or to get wet and soggy. Begonia leaf cuttings should form a root system in around 4 – 6 weeks. A heat mat heated propagation tray set at around 21C or 70F will improve the strike rate of most cuttings. These systems provide heat from the bottom and improve strike rates as well as seed germination rates. In Australia the Ballarat Begonia Festival is the place to experience the wonderful colour of these plants. Taking place over the March, Labour Day long weekend each year, if you are interested in begonias, this is the place.